A new ruler for Feathered Stars. A ruler that measures squares in 1in, 1/2″, 1/4″, 1/8″ and 1/16″ increments – over 50 different sizes from 3/4″ to 4 5/16″. It can be used for rotary cutting squares two triangle squares, and four-triangle squares ( like the Precision Trimmer 6), only with a lot more square sizes. 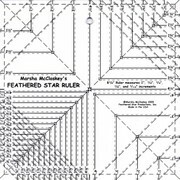 This Feathered Star Ruler would be a great thing to have or give as a gift . Order yours today. This entry was posted on Tuesday, October 13th, 2009 at 5:34 pm and is filed under Uncategorized. You can follow any responses to this entry through the RSS 2.0 feed. You can leave a response, or trackback from your own site.